I adore granola. I love trying all different kinds. Recently, I bought a ginger granola from Whole Foods. It was so delicious that I thought I’d try to create my own version. It tastes just like it, maybe even better! 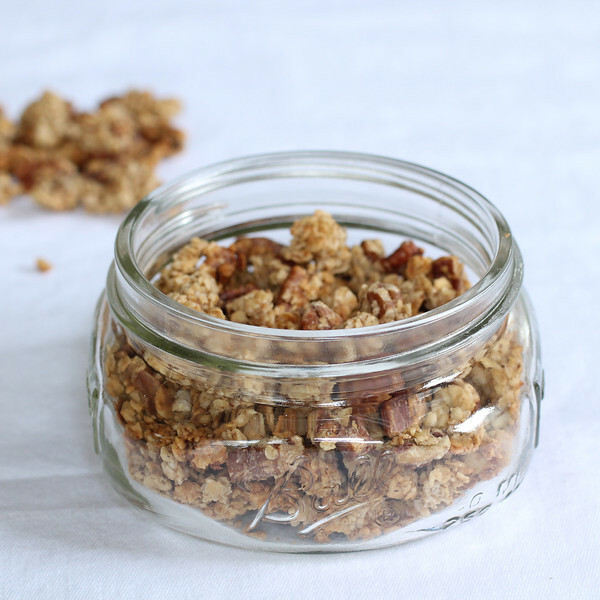 This would even be a great basic granola recipe if you left the ginger out too! Hope you like it! Usually, by the time August comes around, I’m completely over summer and already pulling out my fall decorations. This year has been a little different. I haven’t been in a rush for “what’s next” like I usually am. I’m definitely in love with the stage Turner is in right now. He’s hilarious and non-stop, so I’m not trying to wish anything away! I actually wish time could stand still. Last night seemed to be the turning point for me. I spent the night at Starbucks while Stew hosted a poker game with his friends, and I was enjoying the cooler weather that seemed to just appear out of nowhere! I sipped on my Salted Caramel Mocha and played around on Pinterest. Everything I came across was hinting towards cooler weather: dark nail polish, chunky sweaters, and pumpkin everything! It definitely got me into the fall spirit! This morning, we had a slow start to the day which allowed me time to bake a little fall treat. I love everything apple and pumpkin-spice! 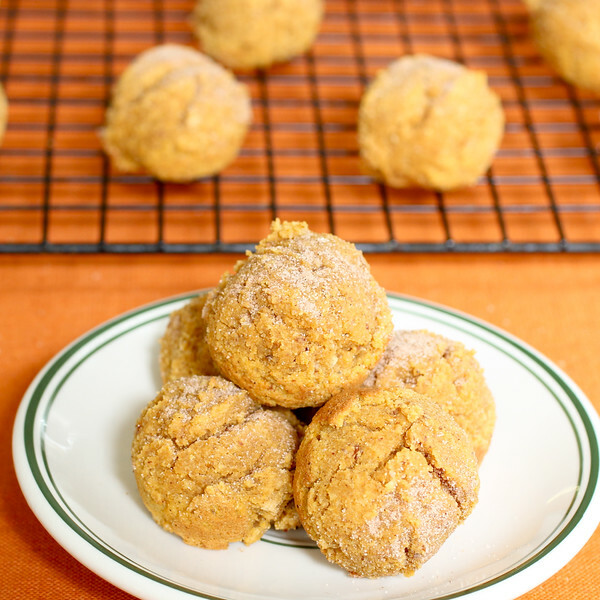 So I made a healthier version of pumpkin spice donut holes. I swapped out the flours and baked them instead of frying. They were absolutely delicious! I had to take a second to share them with you! This granola is AMAZING. 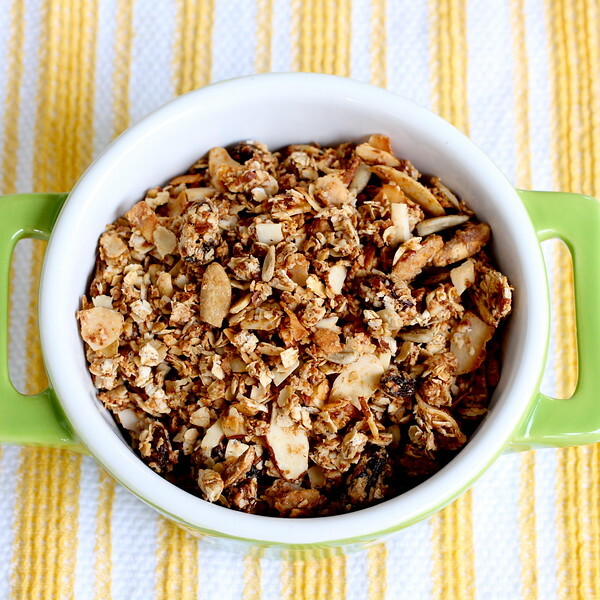 I am always on the search for great granola recipes that aren’t packed with sugar! I recently found a recipe that sounded yummy. The original can be found here. 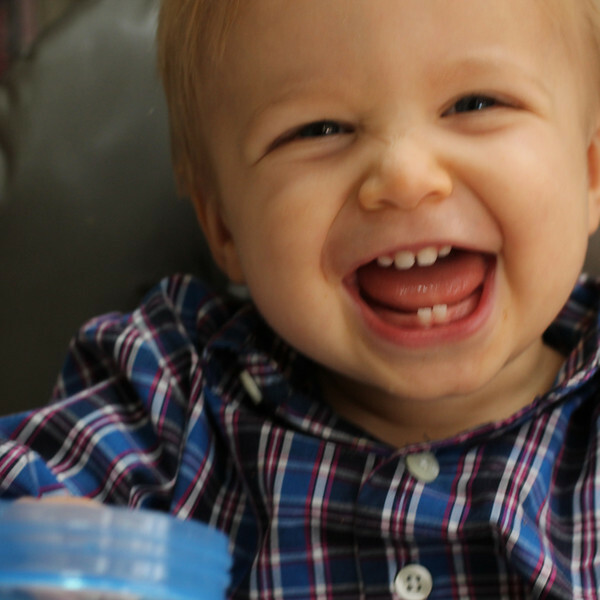 I made a few changes that added some protein and were “toddler friendly” since Turner loves yogurt parfaits! I start by combining the oats, pecans, and cinnamon in the standing mixer. I just give that a quick mix to incorporate the dry ingredients. Then, on the stove, I heat the mashed banana, maple syrup, brown sugar, coconut oil, and almond butter, just until they’re well combined. After that’s combined, I pour it into my mixer and mix until the oats are completely coated with the wet ingredients. I spread it out on a baking sheet and pop it in the oven for 30 minutes. And, there you have it! 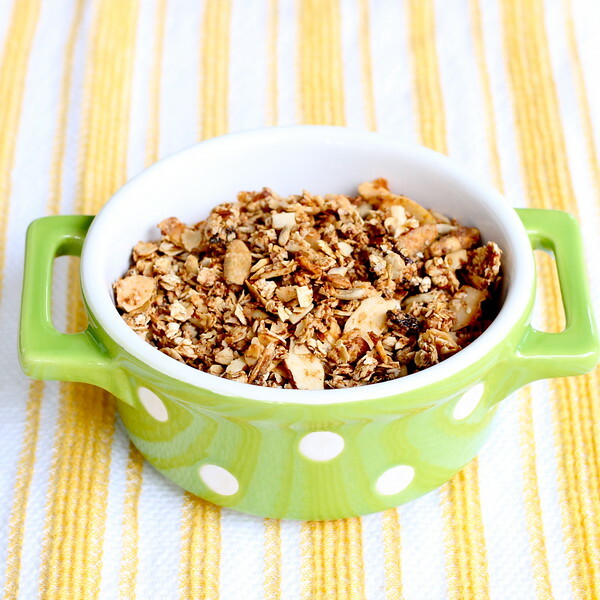 A delicious granola recipe for everyone in the family! The warm weather has gotten me in smoothie mode! And, since I don’t puree baby food for Turner anymore, I find that tucking secret ingredients into our smoothies is the perfect way to get his veggies in! 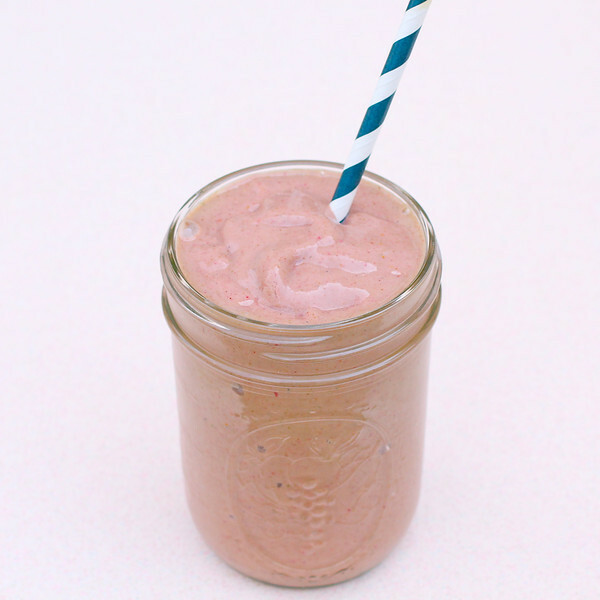 I just make a big batch so I can have a full smoothie and he can have a mini one! This is our absolute favorite, as you can tell by Turner’s expression! I found a delicious recipe months ago that I’ve been meaning to try. 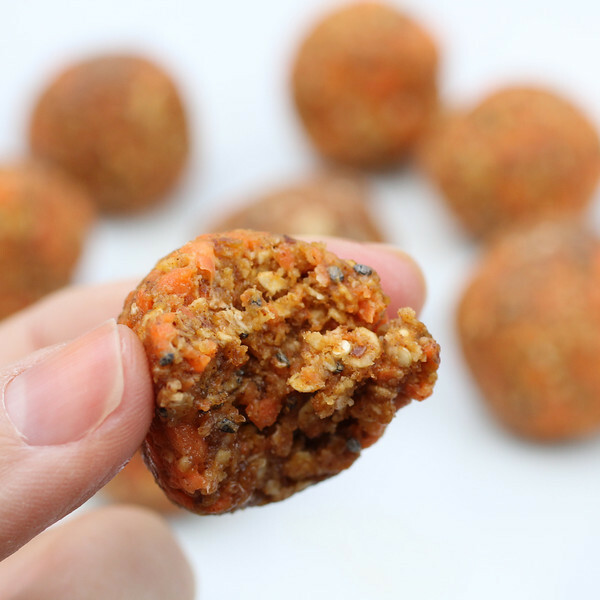 I finally had some time to test recipes this morning and came up with a little spin on these Carrot Almond Butter Bites. I kept it pretty similar. 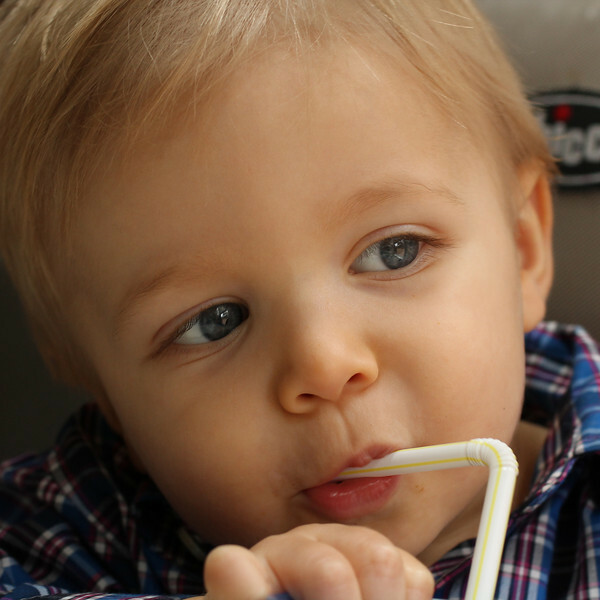 I just changed up a few ingredients and blended it up in the food processor so it’s extra “toddler friendly”. I received an email last week from our farm share letting us know that Farmer Pete was on his way back from Hendersonville, NC with a truckload of honey crisp apples! I nearly jumped with joy! I immediately ordered a half bushel so we could pick it up with our delivery last Thursday! Since then, we’ve been eating apples like it’s going out of style! Now that the weather is finally cooling down, I am ready for some apple butter!!! In an effort to take the sugar out of our diets, I made a healthier, homemade version, of apple butter using our honey crisp apples!! I started by scrubbing all of the apples and cutting them into quarters. I removed the cores and stems. Then, I put them into the bowl of my slow cooker and threw in the rest of my ingredients! As the hours go by, the apples just melted and caramelized. I stirred the apples every few hours to keep them from burning on the bottom. After 20 hours on low, I ladled the apples into my Vitamix and blended it up. I spooned it into a mason jar with a lid and popped it into the fridge, after tasting it of course! It was DELICIOUS! Rich, thick, and appley! I adore everything fall. As an added bonus, this recipe made the house smell so good! It’s perfect for slathering on our spelt toast, mixing into oatmeal and smoothies, or even eating it by the spoonful! Happy eating! Wash all of the apples. Cut apples into quarters, and remove the stem and core. 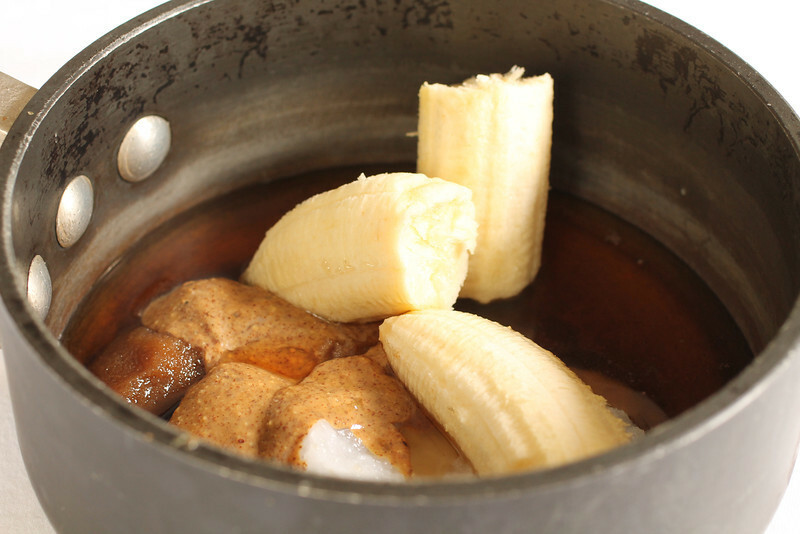 Place apples into the bowl of your slow cooker. Add in the rest of the ingredients. Give it a stir. Turn the slow cooker on low for 20 hours, stirring every few hours. Use a ladle to place the apples into a blender (or use an Immersion Blender ). Blend until smooth. Store in an airtight container in the fridge or freezer for up to one month. 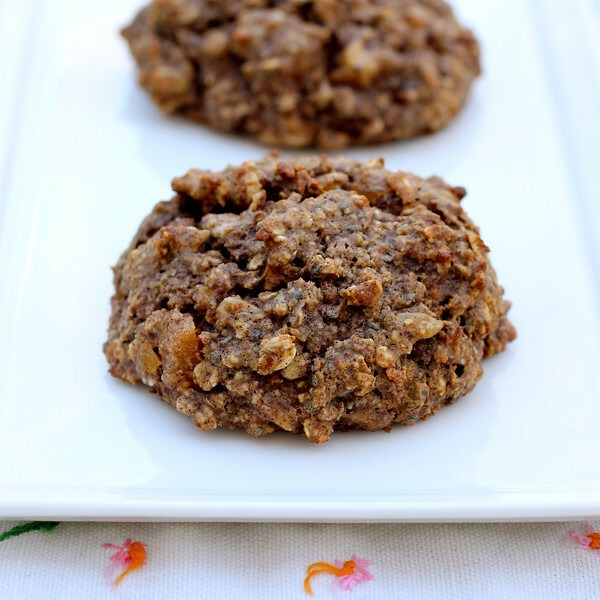 I call these cookies, because they’re just as good. But there’s really nothing “cookie-like” about these, other than their shape. They don’t have butter, sugar, flour, or anything “cookie-like” in them! They ARE, however, full of protein and flavor. 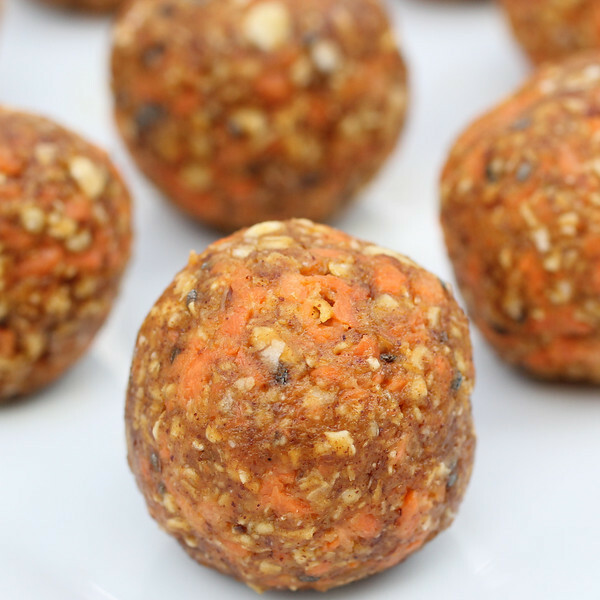 They’re the perfect option for a quick snack or a breakfast on the go. Having a small baby and a full time job makes it difficult to get a good meal in. Turner is getting much better with age. I can sit him in his high-chair while I cook, and he just watches me. But I definitely still have a million things to do in a day! So this is my go-to breakfast or snack! Potatoes get a bad rap…poor little guys. They really aren’t bad for you! They are starchy, yes, but in moderation they’re fine! The reason they get a bad name, is because people usually eat them fried or doused in oil! There’s nothing like a good french fry. Am I right? Stew and I made these one night and became instantly obsessed. They are just as crispy and flavorful as those naughty french fries we know and love but without the guilt! And to top it off, they’re super easy to make! I’ve even used this same method with sweet potatoes. I sprinkle those with some cinnamon which is amazing! I promise this recipe will replace any french fry recipe you’ve used in the past! I start by cutting up the russet potatoes and soaking them in cold water for a few minutes. This removes some of the excess starch. Then, I take them out and spread them in an even layer on a kitchen towel. I roll it up like a jelly roll. They need to be very dry so they crisp up, so let them sit in that towel while you vacuum the house or feed the baby (in my case)! Spread them on a cookie sheet, drizzle oil, salt, and pepper. Mix well with your hands. Spread them in an even layer so they’re each laying flat on a side. Pop them in the oven. Flip halfway through the cooking time. Remember to make sure they are laying flat on one of their sides. Once they’re browned and crispy, take them out. Sprinkle them with a little more salt and pepper, if you’d like, while they’re hot. Dish them up and gobble them down with a big helping of ketchup! Preheat the oven to 450°F. Clean and peel the potatoes. Cut them into matchsticks. Soak them in a bowl of cold water for 5 minutes. This removes some of the excess starch. Spread them in an even layer on a kitchen towel. Roll it up like a jelly roll to dry the potatoes. 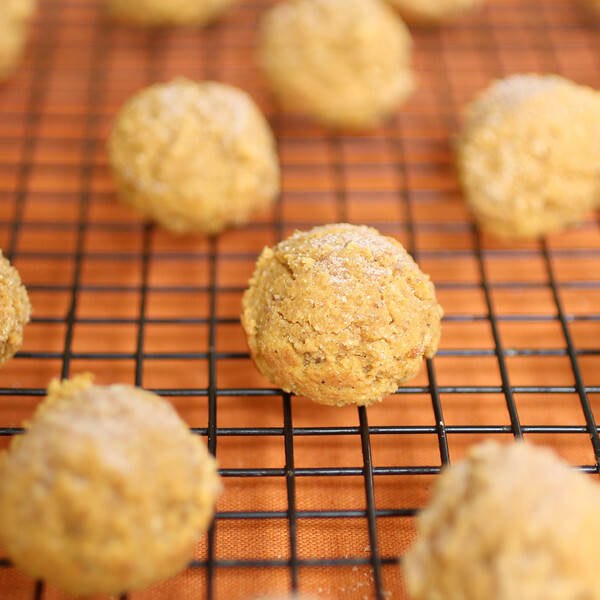 Spread them in an even layer so they’re each laying flat on a side on a cookie sheet. Drizzle with olive oil, salt, and pepper. Mix well with your hands. Bake for 25 minutes. Make sure to flip occasionally during the cooking time, and make sure they are laying flat on one of their sides. Once they are browned and crisp, remove from the oven. Sprinkle with some sea salt to taste. We usually have Sunday dinner at my mom’s house with the whole family. Last week she made a turkey sausage lasagna that was to die for! My mom is the most amazing cook. I learned everything I know from her. We always talk about recipes and different ingredients we experiment with. One of us will try an ingredient, tell the other about it, and low and behold, it will end up in the other’s cabinet! I always bring something to Sunday dinner, whether it’s a dessert, appetizer, side, or salad. I never show up empty handed! So when I asked my mom what she needed me to bring, she said an appetizer. Stew and I were trying to think of something we haven’t had lately that would go well with Italian. We’ve done the whole antipasto platter, caprese salad, and bruschetta thing. So he thought of roasted garlic! My family is full of garlic fanatics. We went to my mom’s early and roasted the garlic at her house while we hung out. Me, Stew, Mom and Michael (my stepdad) ended up eating 4 of the 5 heads of garlic before anyone else even showed up!!! It’s a good thing we all had bad breath together. It was roasted to perfection. The perfect starter for our yummy lasagna! All you need is a nice crusty baguette, some garlic heads, olive oil, and salt & pepper. Cut the tops off the garlic and place them in a garlic roaster. If you don’t have a roaster, you can put them in a pouch of tin foil! Drizzle the garlic with olive oil. Then sprinkle with salt and pepper. While the garlic is roasting, slice up the bread. Coat each side with nonstick spray and sprinkle with salt and pepper. You can use a grill pan if you don’t have an indoor grill. Just cook them for about 3 minutes on each side until they get nice grill marks and are a bit crisp. The garlic should roast at 350° for about an hour. It will come out looking brown and will be very soft to the touch! You can always sprinkle with a little more salt and pepper if you want. Plate it up and enjoy! Preheat the oven to 350°F. Cut the tops off the garlic and place them in a garlic roaster. If you don’t have a roaster, you can put them in a pouch of tin foil! Drizzle the garlic with olive oil. Then sprinkle with salt and pepper. Place the garlic in the oven for about an hour, or until the garlic is brown and starts to pop out of its skin. It should be very tender to the touch. While the garlic is roasting, slice the bread into 1/4 inch slices. Coat each side with nonstick spray and sprinkle with salt and pepper. You can use a grill pan if you don’t have an indoor grill. Cook them for about 3 minutes on each side until they get nice grill marks and are a bit crisp. Serve the bread alongside the garlic. Use a small butter knife to scoop out the garlic and spread onto the bread. Bon Appétit! I’ve been in total baking mode lately. I’m pretending it’s Fall, even though it’s still 90 degrees during the day. The only problem with baking is that I end up with all of these empty calorie laden treats calling my name case in point, the chocolate chip cookies sitting on my kitchen counter that I’m hoping the hubs will eat before I do! I was all ready to make a pumpkin spice cake filled with WHITE flour and ZERO nutritional value. Then I thought, let me see if I can create a semi-healthy recipe that will satisfy my empty calorie-pumpkin-spice craving! Well, let me tell you, I DID IT! When I bit into this granola, I felt like I was in pumpkin pie heaven! I opted to put in just enough chocolate chips for a sweet bite, but not too many where I’d feel guilty after eating it. You can definitely leave the chocolate chips out and replace them with nuts or dried cranberries, which would be delicious too! I wish you could have been here while this was baking. It literally smelled like Thanksgiving in my house (minus all the calories)! I hope you enjoy this little Fall treat! Preheat oven to 350 degrees F. Combine all ingredients in your standing mixer and, using the paddle attachment, stir on low until well combined. 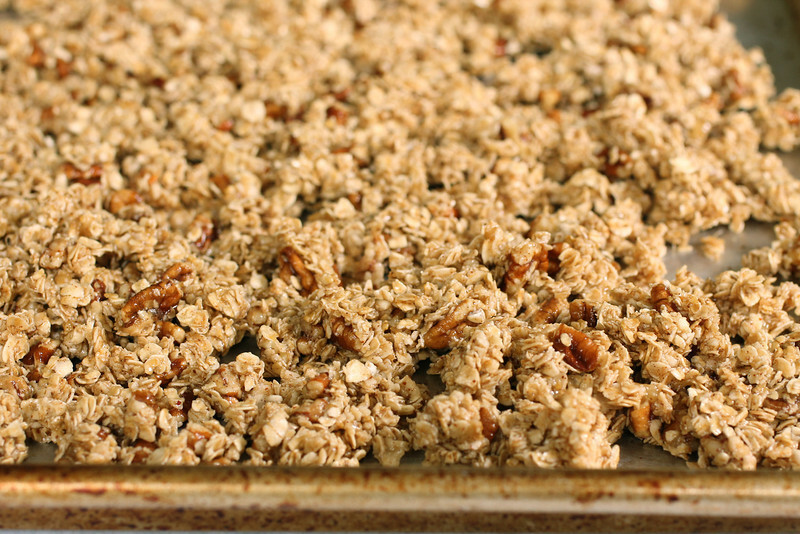 Spread the granola onto a baking sheet and bake for 15 minutes. GENTLY toss the outer granola into the center so the edges don’t burn. Keep in mind, the chocolate chips are melted and will spread throughout the granola a bit. That’s ok! Continue to bake for another 20 minutes. Let cool COMPLETELY on the baking sheet. Once cooled, store in an airtight container. Enjoy!